Begin standing with a barbell close to your shins. Your feet should be directly under your hips with your feet turned out slightly. Grip the bar with a double overhand grip or hook grip, about shoulder width apart. Squat down to the bar. Your spine should be in full extension, with a back angle that places your shoulders in front of the bar and your back as vertical as possible. Begin by driving through the floor through the front of your heels. As the bar travels upward, maintain a constant back angle. Flare your knees out to the side to help keep them out of the bar's path. After the bar crosses the knees, complete the lift by driving the hips into the bar until your hips and knees are extended. These programs with this exercise «Clean Deadlift » are among the best rated by athletes. 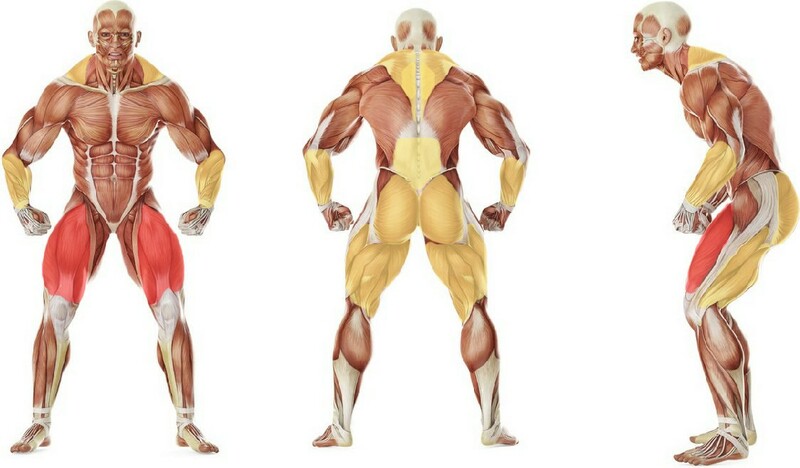 You can try replacing the exercise «Clean Deadlift » with one of these exercises. The possibility of replacement is determined on the basis of the muscle groups involved.